Line Conditioner. High sensitivity voltage meter. 6 unswitched outlets for components that require constant current. 2 switched outlets. 2 switched/timed outlets for sequenced power turn-on. $100,000 connected equipment protection and limited lifetime warranty. This is an audio performance based review. I had been previously using an Adcom ACE 515 AC conditioner on my source components, and while this provided some protection, I did not really notice an audible sound improvement. I spin records and SACDs mostly, and listen often. I was simply astounded by the increase of audio definition with the introduction of the Monster. **One thing I have always noticed with my system is that it sounded WAY better late at night- now it sounds better than it did at 3 a.m., all the time. I have dedicated 20 amp 10 guage circuits to my audio system and this alone made a huge improvment- +3 volts on system startup with only an around 30' run from the breaker panel. With the Monster, I noticed a greater improvment than even this yeilded- a bigger soundstage, better seperation of instruments, better dynamics and a quieter backdrop. Overall, a less constricted and confused presentation, and most of all a more enjoyable listening experience. My speakers are Magnepan IIIAs- very touchy when it comes to anything upstream. I noticed a lot more air and even FASTER sound than before. The ribbons now have even more finesse. I would have to say that the the HTS 3500 II provided a more substantial improvement than a moderate component upgrade. I never knew just how much filth there was on my power lines. Ok, here are the few (minor, compared to it's benefits) things about the unit that could be improved. When I recieved my unit, its internal voltage meter read low- about one volt as compared to a good multimeter (Amprobe) I tested the line with. Easily calibrated though. The LEDs on the front panel are a little bright, but still look good. The critical connections inside are crimped terminals, and should be directly soldered IMO to provide maximum transfer and avoid corrosion. I pro- golded all the terminals. The main power routing could be point- to- point wiring instead of PCB traces, but the traces are pretty thick, and of course the unit had to meet a price point. The 3500 would not support my high current amp, and I certainly wouldn't ask it to in it's price range. My amp, btw is a Counterpoint SA-220 hybrid, and works best powered straight from the wall. It just bogs the unit down too much. If there was a reasonably priced stand- alone high power filter or isolation transformer, I would give it a try on the amp. The HTS 3500 mk. II made a huge improvement to my system, looks right at home with high- end components with it's black/ brushed aluminum front panel and illuminated meter, and exceeded my expectations. Marsh and the gang really know their stuff. I would highly recommend this unit to audiophiles looking to get rid of all that grunge in your AC line. Awesome video filter. Your TV will be line free along with fantastic colour. Probably due to the super black you get with the 3500 mkll. If your system is to bright this is a bonus. I really like the looks of this thing. For $150 it looks better than a surge protecter bar that can cost twice as much. Added up I probably have $10,000 in audio and video equipment. This is the main reason for having a surge protector the rest is a bonus. You have to like bright LCD's. This lights will burn out your eyballs. Owners manual is cheap and not helpful. Wife thinks I lied about the cost. More relationship stress. This is a great product for what it does. I stopped reading the reviews of others after 30. Personally I like this unit. 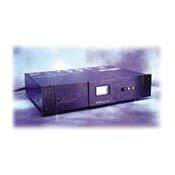 I have used an older Panamax in the past but just for a surge protector. I bought mine on ebay for $150. I'm not sure if it's a newer one or not. It's a HTS3500 mkll. With my sound sytem this unit works great. I've always thought the mixture of my components made for a 'bright' sound. Probably from my Paradigm monitors. I should have got silk dome tweeters. Anyway, as soon as I plugged in the 3500 it produced a wonderful, full sound. Deep rich base, fine smooth highs. The Monster blew me away with super fine video picture. Awesome! I'll have to use this from now on. Problem is I need two for the two TV's I have. All you people who hate your 3500 mxll's email me and I'll take one off your hands. Panamax surge protector but not with an audio or video filter. People will claim it does all kinds of magical things to their soundstage or that the video is sooooo much better because of it. Nonsense! It can't do those things. It can do what it is supposed to do however. I bought it so I could use the remote for my pre-amp to turn on all the other equipment by using the 12v trigger from the pre-amp to the power center. (My amp doesn't have 12v trigger capability.) I also wanted a surge protector. Finally, I thought it looked cool and for 60% off retail I decided it was actually priced appropriately considering how horribly overpriced Monster stuff is at retail. When I was wiring everything together in my cabinet, I forgot to plug in my subwoofer to the Power Center. I decided to plug it into a wall outlet. When I was leaning over the subwoofer, after I plugged it in, I noticed a faint hum. I could only hear it when I was within 2 feet of the sub and when everything else was turned off. (It was probably a ground hum.) I decided to go to the hassle of pulling my stereo cabinet away from the wall and feeding the plug through the back and into the Power Center and the hum went away. Would I have been able to hear the hum 14 feet away at my listening position? Of course not. But, the Monster equipment did what it claims it does. It made the hum go away. One final comment. It is a glorified surge protector. If will protect your equipment from spikes and surges. It will NOT protect your equipment from brown-outs or power 'sags'. If you have real electricity reliability problems look elsewhere. If you can get this stuff for at least 50% off retail then go for it. Otherwise, buy one of the other brands. They're frequently heavily discounted. This stuff is not magic. It's not going to make you more handsome or smarter. But, it can be a worthwhile addition to your system if it's discounted and if you don't drink the Kool-Aid and believe it is the be-all and end-all. MY VALUE RATING BELOW IS BASED ON THE DISCOUNTED PRICE AND NOT RETAIL. AT RETAIL, IT'S JUNK. Other various surge protectors and UPS. easy to install, well laid out, attractive. I particularily like the meter and was surprised to see such changes in the voltage in the lines in my home throughout the day! I see that there are several reviews listed here about this product. I will start by stating that I am not a fan of power conditioners for the most part. I have used some on the front end of my stereo (2 channel) system with mixed results. That being said, I did want to see what effects a power conditioner would have on the home theater system. I will also add the caveat that I have not spent nearly as much on the home theater system that I have on the stereo, as I prefer to listen to music rather than movies, at least, most of the time. Okay, the disclaimers are out of the way. So, I buy a Monster HTS3500 Mk. II and take it home. Out of the box it comes, the home theater system gets all plugged into it as well as the TV (44 in. Toshiba) and I put in MASTER AND COMMANDER - FAR SIDE OF THE WORLD...insert dropping jaw image here...I watch the movie without moving. In goes another DVD, then another, then another. In the immortal words of Ray Raymano's TV dad, "Holy Crap!". This piece of gear is great! Blacks are blacker, images crisper, as if I added several hundred more lines of resolution on the TV. The wife is impressed, and that is not easy to do! The future son-in-law comes over and he cannot believe the difference! He believes that the TV is different in some way, that I got a new one that looks like the old but is newer in some technology that has changed the picture. The surround sound is excellent, with better definition and bass. Voice is cleaner, more focused. All in all, I was left with jaw hanging open, and stunned at the difference. I cannot speak for the effects the Monster would have on two channel stereo, and I imagine that if you have a bazillion dollar system, it might not "float your boat". But! If you have a $3000 or so home theater system, or perhaps are new to the high end in music and your gear is sounding a little less than you'd like, I would honestly recommend you try one of these. Being a skeptic on power conditioners, I cannot impress upon anyone reading this how much this Monster HTS3500 is making me rethink my policy on that. Looks good, definatly gives the consumer a peace of mind. Remote AC control doesnt work. Very good product. Monster seems to always have good product. Yes everyone is right, your paying for a name so get over it. Like you didnt buy the name on all of your other equipment. With a good name comes good quality. The one problem I have is that the remote ac hookup is not designed properly. I hook up my reciever (Marantz SR7400) to the a/v reciver plug, turn on the remote and that pretty much end any power to the reciever after turning the reciver off due to the fact that the plug on the back of the power center is a switched outlet. Switched outlet to switched outlet = no power. Not a big deal but why bother putting on the unit if it doesnt work. feel free to email me with any comments about this. Maybe and I mean just maybe I am having a brain fart and not hooking it up right. Marantz Equipment Paradigm Speakers.... Awsome Awsome Best speaker on the market in there class. I recently purchased the 3500mkll on an impulse. After reading some bad reviews here on audioreview.com, I was worried that it would not perform well. I opened it up and immediately connected all of my gear to it. As I was unplugging everything I noticed a big hum coming from my sub and my center channel. After plugging everything into the monster, it was like magic. Your noise floor becomes almost nonexistant. Video looks wonderful. My main concern was with what it would do to my sound. The bad reviews here had all been about it killing your sound. This may be true for the 3500 but not for the 3500mkll. The 3500mkll does a great job at recreating sound. granted it does take a little bit of the top end but that can be compensated for. Another issue I wanted to address was the misconception that somehow this device will give you more power. If you have bad power in your home, than a device like this will only clean the already existing power wether it be enough or not. In order to take your existing power and make it better, you need something like a ps audio power plant. As far as this device, it does what it is supposed to. I won't work miracles in your system but it will definetly clean up your audio and video. Plastic plugs; rear panel should be made of reinforced metal. This unit works as advertised. Be careful, though! The video filter includes a plug labeled "A/V Receiver", but that filter section has a significant effect on sound quality. Instead, use the switched amplifier section (if audio quality is more important than video being routed through the receiver). Since I don't use my receiver for video signals at all, the amplifier section works great. Basic power strips. I cannot judge the effect of the HTS3500 in relation to comparable products. i was very sceptical about this product but all my fears vanish after setting it up and listen. I did not experienced loss of quality i experienced BIG IMPROVEMENT!! MY SYSTEM SOUNDS BETTER THAN EVER I HAVE THIS SYSTEM FOR A WHILE SO I KNOW IT CAPABILITIES. ( DENON RECIEVER WITH BOSTON REFERENCE SPEAKERS) I JUST KNOW ONE THING MONSTER NEVER LET ME DOWN AND I THINK THEY MADE ANOTHER GREAT PRODUCT. Cosmetically attractive (as opposed to the new model of HTS3600 with its gee whiz use of obnoxious LED's.) Many recepticals that will handle most any home application, included cord labels, price worth the performance gain. Awful photocopied piece of garbage manual. Needs more Timed shutoffs. LED's are a little too bright for home theater. Included TV Cable is too short to reach anywhere. SHould not have even included the thing. I was not expecting much when I bought this unit. I bought it mostly for surge suppression and expected a tiny bit of sound improvement through filtration of incoming power. That was where I was wrong. WOW! I have a full Pioneer Elite system including and VSX41 7.1 receiver, M-72 2/4 channel amp, DV-C36 DVD/CD, and PD-F07 CD Changer. My speakers are Mirage M-890i for FR and FL, Paradigm CC-170 Center, Paradigm Atoms for Rears, and a Mirage BPS-150 Sub. I have purchased all the Mirage components over the past three months and each one has improved the sound I receive. BUT, this Monster HTS3500 has bee a huige jump in performance; far beyond reasonable expectations. AC power in my area is wildly variable (like in most areas) and at certain times of day it was almost useless to listen to the stereo because of the poor performance. Now, the treble is crisper but a little more controlled. The treble from the speakers used to be enough to make your ears bleed. Not any more. Bass tightened up and trails off more gradually. As for video performance, I noticed blacker blacks and slightly sharper images. I used to get horizontal bars that would traverse the screen. I have not seen this since I installed the Monster. Read the "Audiophile" type reviews if you like. Then quickly forget what they say. If you spent $25,000 on your stereo, why in the world would you purchase a $400 line conditioner? Bad mouthing this unit is a little myopic. For the general Audio Enthusiast this unit is wonderful. You may not get the OMG results I did, but even if not, you will get far more performance than you think you can get. Great Job Monster for making a product that does what is advertised! Manual a little weak. Still, it's very simple to hookup.